Cookies, Crayons, Classes, & Chaos: Can I use girl power to move this boulder? 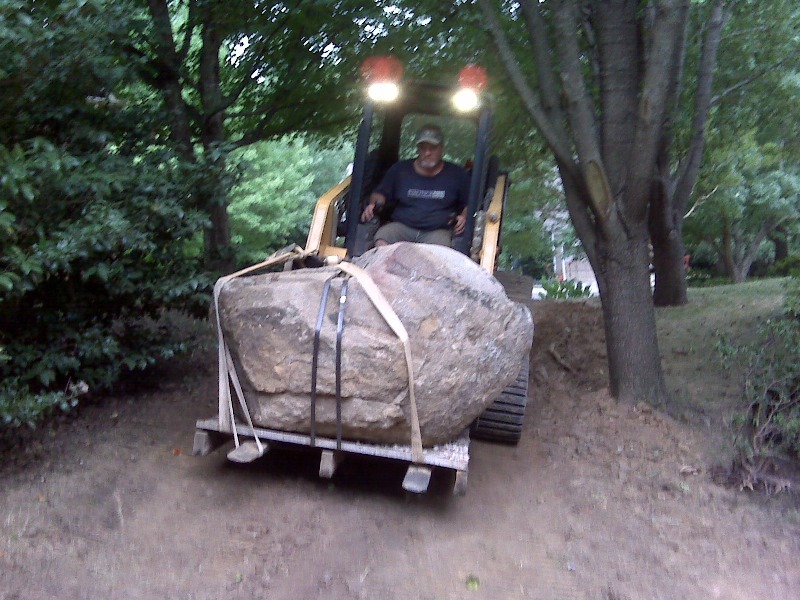 Worse than my need to continually move furniture, I have recently decided I need to move our 1-2 ton boulder (again) to make room for the kid's wooden playset. My wonderful parents drove their truck and trailer with the skid steer up a couple summers ago. My dad yanked this boulder out from under the blue spruce and relocated it for me. This 2 ton capacity skid steer had its rear end up in the air while it was man against machine. Man finally won. Sidewalk and rock lost. A sonic boom could be heard throughout the neighborhood when the rock dropped on the sidewalk [crack!] and was nudged into position in the yard. The house shook. Pictures fell off the wall. At that point in time we had a neighborhood kid who cut through our corner lot (walking right by our window which was creepy). 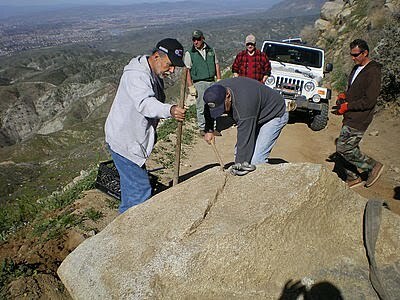 So I thought putting the boulder in this spot would create an obstacle making the short cut, not so short. That worked. But the girl graduated from high school shortly thereafter and no longer walked through our yard on the way home from school. Fast forward a couple years and now the rock is in the perfect shady spot for the kids wooden play structure we got for free from Craigslist. We had to disassemble this wooden structure and carry it to the U-haul for transport back home. Since nails (not screws) must have been de rigueur 20 years ago, we wanted to keep as much of the structure intact as possible. Rolling and scooting are amazingly powerful tools. And so are super wonder bars!! So now I'm trying to figure out more "girl power" methods for moving this boulder about 10 feet. The skid steers I can rent have a much smaller load capacity than dad's so I'm not inclined to try that option. A power winch looks like a critical element to my plan. 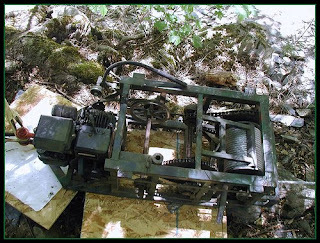 Here is a small handmade winch modeled after the kind used to pull boulders the size of small cars that www.nowherenevada.com made to pull a boulder out of a stream using the winch, some inner tubes, and tow wraps. Nowhere Nevada says "I have seen this thing pull giant boulders out of the ground with ease" and I hope that is true. Case in point, these California jeep club members managed to move a 4000 pound boulder with a winch one guy had tried unsuccessfully to sell for $80 at a garage sale. 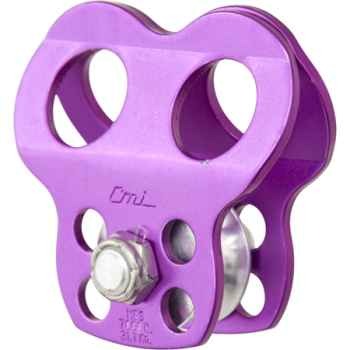 It sounds like I could also benefit from the smartly placed pulley, like this CMI* Double micro pulley 7000 MBS one recommended by Mephisto from the Canadian Gold Prospecting forum. 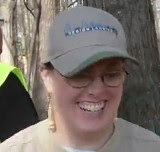 *I worked as a temp at the CMI permanent mold factory after college and could tell some wild stories about that place! But most memorable is the hot, dangerous, working conditions of the guys (women need not apply - your applications got thrown away) on the floor and how one of them got his arm cut off in a press. I totally love that it is purple!! It's perfect for my girl powered boulder moving system. Mephisto uses small but "pocket sized boulder puller pulley systems" claiming to have hand winched his truck on his own. Mephisto says "You need two of these pulleys, two webbing slings, 4 carabiners and about 100' of 7 - 8 mm [7mm kernmantle] static line. You choose an anchor point (truck, tree etc) , attach one pulley to the anchor point via a sling and biner, and the other pulley via sling and biner to the rock you want to move. Thread the rope thru , block and tackle style and start pulling. 4-1 MA, one person can move a surprisingly large amount of weight." WINCH + PULLEY = SUCCESS? 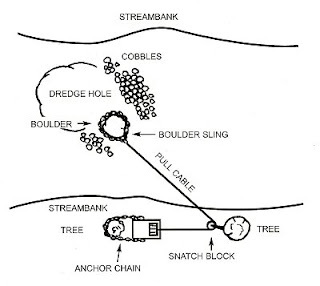 Similarly, Dave McCracken offers a visual diagram of this type of winch and pulley system to move boulders from a stream bed. I'm hopeful this might work. Off to craigslist for a winch!